It seems simple enough. A few hours’ work should fix those flickering lights, power surges, bad wiring, or a faulty breaker. At first, all is going well, and then—ZAP! DIY home electrical work is dangerous. Without the proper training and tools, you can be severely injured or killed. These are among the many reasons you should avoid DIY electrical repairs. The immediate safety danger leads off our list of the potential consequences of doing electrical work without professional experience. Electrocution: Any electric shock can be deadly. Even if you’re working with 110-volt lighting fixtures and power outlets, you can get quite a jolt. Appliances such as ovens run at higher voltages, up to 240 volts, which can be deadly. 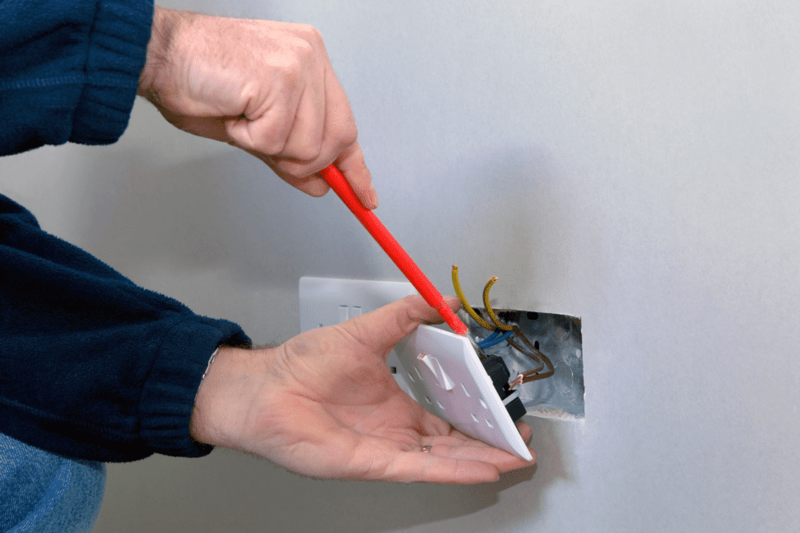 A mistake as simple as touching the wrong wires together or switching off the wrong breaker can be fatal. Fire: You can literally burn down your house by placing one wire incorrectly. In the short term, everything might seem fine. An electrical fire hazard can remain hidden for weeks or months before a misplaced or loosely connected wire shorts out. Even the wrong gauge wire can overheat, cause a spark, and ignite a fire. Installing the wrong product: There are many different types of wires, switches, and outlets. Some are best suited for certain installations. Putting in an incorrect product, no matter how small it is, can lead to big problems, not to mention limit the function of your fixture, appliance, or electronic device. Costly repairs: Many people go the DIY approach to save money. You’ve avoided injury and a fire, but miswiring one device can cause irreparable damage. Once you call in an electrician, you’ll quickly learn hiring a licensed technician in the first place would have saved a significant amount of money. Hidden dangers: Do you know where all your home’s junction boxes are? These are usually in hidden areas such as the attic or behind a wall. By attempting electrical work on your own, you risk touching something with a high electrical potential. An electrical burn or shock often occurs where and when you least expect it. Building permits: In most places, a building permit is required to perform electrical repairs, installations, upgrades, or any work. Professional electricians are aware of when a permit is required in your local area. They can even handle the entire process, including the paperwork, for you, avoiding code violations and hefty fines. Not using a GFCI: A ground fault circuit interrupter cuts the flow to an outlet if moisture is present. As a DIYer, you might not know about this option or when/where to use it. If you install a standard outlet instead, you may be in immediate danger; a certified electrician can tell where you’d benefit from a GFCI outlet or switch and install it without incident. Other reasons to avoid DIY home electrical work include having paperwork to prove electrical service was done by a professional. Future potential buyers may feel more secure knowing this. Also, if you do home electrical repairs yourself, you risk voiding your homeowner’s insurance policy or being denied coverage for fires and other problems related to your actions. Besides, electricians can complete jobs much faster than if you attempt a DIY repair. Time is one of many reasons already mentioned why you should call our Los Angeles electrician. For information or to schedule service, contact Express Electrical Services, which is available 24/7 and serves Los Angeles, Orange County, Riverside County, and all of Southern California.